An approach to musicianship that is fun and appealing! Focusing on keyboard skills such as five-finger patterns, scales, sightreading, ear training and transposition, this series is designed to prepare students for National Guild of Piano Teachers musicianship requirements. Logically organized by Musicianship Phase. 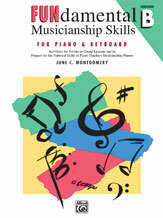 Includes practice suggestions and enjoyable exercises.